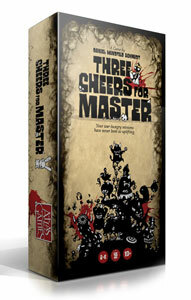 We've had a ton of fun with Three Cheers for Master since we released it this summer. One of the most rewarding things has been showing it off at conventions and in demos ever since. Last weekend, when we ran demos all day at Source Comics & Games in the Twin Cities for their Jubilee Sale, we sold out their stock and generated a ton of follow-up demand the weekend after. Good thing they're ten minutes from our warehouse! We want everyone to learn to play Three Cheers for Master, so we recorded a learn-to-play video you can watch here, watch on the Three Cheers for Master product page, download to your devices to help your friends learn (600 MB), stream from YouTube because that's often convenient, and even put in rotation on the TV in your FLGS. Check it out, and if you have any feedback for us, please share it! We hope to do more of these for our other games, so we'd love to know what you think.